This recipe was inspired by a cucumber salad that some good friends served us a few weeks ago (thanks, Carol and Bob!). They, in turn, were inspired by a recipe in Andrea Bemis’s Dishing Up the Dirt. The original recipe used a vinaigrette-style dressing, and didn’t contain salmon. We love creamy feta, so we replaced the original dressing with one of our favorites. The original also included avocado, which we omitted – you might want to add that back in. Exact quantities aren’t critical for this recipe. So feel free to adapt. This salad takes 10 to 15 minutes to put together. This recipe yields 2 generous main-course servings, or 4 starter-size servings. Wash and dry the cucumber(s). If using regular cukes, you may want to peel them and remove the seeds. Slice the cucumbers into thin ribbons, using a vegetable peeler or a mandolin. Place the cucumber ribbons in a large mixing bowl. Cook the peas in the microwave until just done (about 3 or 4 minutes). Rinse the peas under cold water to cool them, then add the peas to the cucumber ribbons. Cut the salmon into slices of a quarter inch or so. Add the salmon slices to the cukes and peas. Clean the radishes, then remove their stems and root ends. Slice the radishes thinly, then add them to the mixing bowl. Rinse off the mint, then dry it. Mince the mint finely, then add it to the mixing bowl. Add the feta to a separate, smaller bowl. Crumble the feta with a fork or a wire whisk. Add the lemon juice or vinegar, then whisk together. Add the olive oil a tablespoon at a time, and whisk until you have an emulsion. Add salt and pepper to taste. Then mix in enough yogurt to create a creamy sauce. Add less yogurt if you want a very thick sauce, more if you want a thinner one. Add half the dressing to the cucumber mixture (reserving the rest for another use; it’ll keep in the refrigerator in an airtight container for several days). Toss all the ingredients until everything is well mixed. Plate the salad. Garnish with mint sprigs and/or reserved crumbles of feta, if you wish, and serve. We like to use seedless English cucumbers for this dish. Their skin is thinner than that of regular cucumbers (and it’s not waxed), so we never peel them. But regular cucumbers would work in this dish too. Lox and smoked salmon are similar, but not quite the same. Lox is salmon that’s been cured in brine, and is often smoked. You can also buy salmon that has been smoked, but not brined. Either will work in this dish. We used smoked salmon (not brined). Feta cheese is usually made from sheep’s milk, or sometimes from a mix of sheep’s and goat’s milk. The real stuff comes from Greece. You often see domestic “feta” made from cow’s milk, which we don’t think is as good as the real thing. We think lemon juice works a bit better in this dish than the wine vinegar, but the vinegar is certainly OK. If you don’t want to use (or don’t have) fresh mint, try fresh dill or oregano. You may also want to add some chopped scallions to this dish. They probably would make a nice addition. Some minced sweet red pepper might add a nice touch too. We generally use kosher salt for cooking, which is coarser than regular table salt (and thus less salty by volume). So if using table salt, use about half of what we suggest. But, as always, season according to your taste, not ours. “Don’t make a feta-ral case out of it,” I said. “Feel cool as a cucumber after that comment?” said Mrs K R.
Better desist now. Don’t want a hoarse radish. Very fresh, crunchy and delicious...definitely my kind of salad! Hi Angie, freshness never tasted better! :-) Thanks for the comment. OK, I'm hooked -- but what I have on hand is smoked trout. It will be in a salad for lunch. Inspired, but not really following your recipe. Thanks! A healthy. complete, balanced meal. And it looks so good!!! Hi Mae, smoked trout would be wonderful! And we rarely make the same exact thing twice, even when we're using the "same" recipe. :-) Thanks for the comment. Hi Denise, looks good, tastes good. Winner! :-) Thanks for the comment. Such a pretty and fance shmancy salad! Love the cucumber preped as ribbons. And big love for smoked slamon and feta. OK I never knew the difference between Lox and smoked salmon, thanks! Hi Evelyne, those cucumber ribbons are so much fun! It's because of them that I wanted to make the salad. :-) Thanks for the comment. Great combination of flavors, colors, and textures. It looks and sounds tasty. Hi Pat, isn't this a fun salad? So many different flavors! Thanks for the comment. Hi Pam, this dish has it all, doesn't it? :-) Thanks for the comment. What an awesome spring salad! The peas and radishes are at their peak right now -- crisp, tender, and spring-y is just what we need with all the rain! Great salad. Second the English cucumber! Always prefer those over the regular ones! 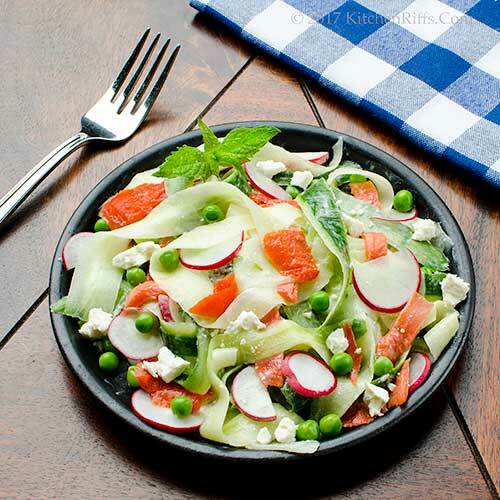 This salad sounds so refreshing and who would ever say no to smoked salmon! Thanks for the recipe! This is pretty much how I eat every night. You included so many of my favorite foods - peas, radishes, cucumbers. Hi Ritu, this really is yummy! :-) Thanks for the comment. Hi Judy, we have outstanding radishes in the store at the moment. Although at the moment our frozen peas are better than the fresh -- go figure! Thanks for the comment. Hi Yi, love smoked salmon! Thanks for the comment. Hi Madonna, :-) Thanks for the comment. Hi Laura, you eat good dinners! :-) Thanks for the comment. What a perfectly spring-centric Mother's Day salad! Love the use of cucumber ribbons and smoked salmon really puts this over the top and makes it extra-special. NOw can I have one of those special cocktails to go with it? This is great, I love smoked salmon. Those cucumber ribbons look so cute. Thanks for the recipe. Hi Abbe, you absolutely can have a special cocktail to go with this special dish! Two, in fact. :-) Thanks for the comment. Hi Amira, the cucumber ribbons are great, aren't they? Love the way they curl! Thanks for the comment. This is a great and healthy idea, John! Loved the recipe and I cannot wait to give it a try! 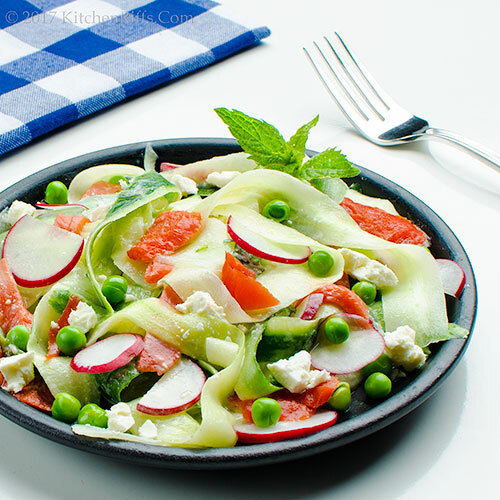 Love all the fresh spring flavors going on in this salad! I also love the way you made ribbons with the cucumbers - such a great way to serve them. Another delicious recipe for sure! Hi Agness, isn't this nice? And it's especially tasty! Thanks for the comment. Hi Tricia, cucumber ribbons are so much fun, aren't they? Love the way they look! And taste, of course. :-) Thanks for the comment. You know how I feel about salmon. Or at least I Hope you know. It's just LOVE LOVE LOVE LOVE so anything involving salmon is a HECK YES in my book!! Hi GiGi, I think I have detected a certain fondness for salmon in you, yes. So this is definitely the dish for you. :-) Thanks for the comment. 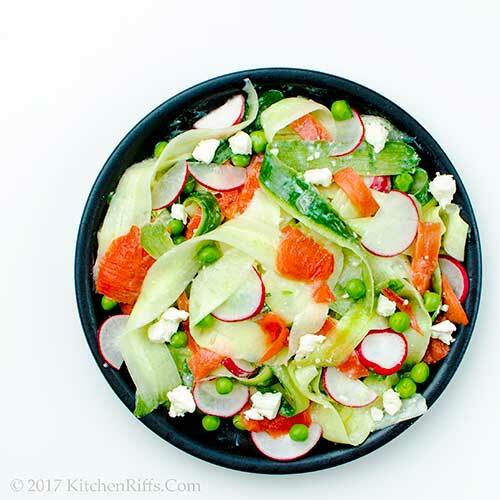 I love how you wove the ribbons through that salad and popping that green color in the peas makes all the difference for me. Also, I love that dressing! Hi Maureen, that dressing is fantastic -- really worth trying. And it was the chance to play with the cucumber ribbons that made me want to make this. :-) Thanks for the comment. Such a delightful fresh spring salad! The addition of mint is perfectly delightful. How do you and Mrs. Riff think of all of your sayings at the end of your posts? You guys are so much fun. Wishing you a super week John! Hi Bobbi, usually the dish we're making suggest some of those sayings. And we bounce them off each other -- kind of build on each other's idea. :-) Thanks for the comment. This looks delicious! Anything with feta is a-ok in my book :). Have a great rest of your week! What a perfect salad, cucumber and salmon; a match made in heaven. Hope you both are having a great week! Hi Kelsie, feta is a great cheese, isn't it? Thanks for the comment. Hi Cheri, isn't this a neat salad? Such good flavor! Thanks for the comment. This is the perfect salad for a house full of German guests. Thank you John. What a delicious salad! Light and clean, but so obviously packed with flavor. Hi Gerlinde, enjoy! :-) Thanks for the comment. Hi Jeff, TONS of flavor in this. TONS. :-) Thanks for the comment. I don't think I've ever seen a more perfect Spring Salad. Thanks for sharing this one John. Hi Lea Ann, it's a good one, isn't it? :-) Thanks for the comment. Looks delicious, John! I really enjoy smoked salmon and should try to incorporate it into more dishes (other than on a bagel with cream cheese lol). Hi Amy, smoked salmon and cream cheese is a great combo! 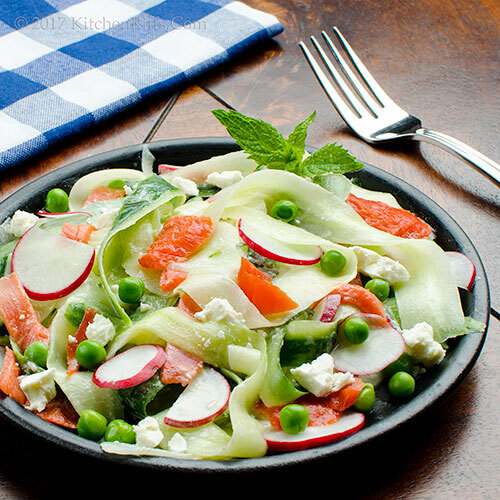 Love salmon in any form, and the smoked goes so nicely in this salad. Thanks for the comment. Beautiful and colorful salad John...I love the smoked salmon in it and the refreshing mint...and yes, I could have this salad as my main meal. Loving the feta dressing on this savory salad, easy and bright with flavor. Another great salad recipe! I've never had smoked salmon in a salad before. This looks amazing. Hi Juliana, this is pretty, isn't it? And really tasty. :-) Thanks for the comment. Hi Deb, feta makes a wonderful dressing! Really worth having. :-) Thanks for the comment. Hi Peachy, a little smoked salmon goes a long way, so it works really well in a salad. Thanks for the comment. This looks like the perfect Spring salad! Hi Pamela, it's a really good one! :-) Thanks for the comment. Hi Robyn, this is definitely spring on a plate. :-) Thanks for the comment. Oh John, I do love this salad! Sometimes I'll make a simple cucumber salad and serve it as a side to smoked salmon. Adding the smoked salmon to the salad sounds even better. Love the feta dressing as well. The local market has had some beautiful sugar snaps lately that would be great peas for this salad. Hope to make this soon! Thanks! Hi Carolyn, really like the idea of smoked salmon with smoked salmon. :-) Thanks for the comment. Hi MJ, cucumber and salmon is such a natural combo, don't you think? Love the idea of sugar snaps in this -- fun! Thanks for the comment. How refreshing this looks! Cucumber and smoked salmon are such a great combination. Feta is the perfect choice to go with this salad. Nice! Hi Holly, this is a wonderful combo of flavors! Really satisfying. :-) Thanks for the comment. Cucumber and smoked salmon sound like a match made in heaven. I love feta cheese and this feta dressing on savory salad sounds like a lovely idea. I bet this easy and bright salad would make a nice treat for this slightly warm weather. Hi Anu, this is a wonderful dish for this time of the year. Or any time, really. :-) Thanks for the comment. What a combination!! I absolutely love smoked salmon, but I have never thought to put it in a salad! Hi Greg, I won't say baa to that. :-) Thanks for the comment. Hi Cathleen, you have to try this! SO good. :-) Thanks for the comment. Just leave out the cucumber (it's not my 'thing') and this salad will hit the spot! Hi Fran, we actually have left out the cucumber (and the radishes) and done a pasta-based version of this dish. Very yummy! And you may (or may not!) see it on the blog at some point in the (probably distant) future. :-) Thanks for the comment. Just going through the list of ingredients I can imagine how good this must have tasted. Hi Taruna, fun list of ingredients, isn't it? :-) Thanks for the comment. Hi Liz, cucumber ribbons are fun (and tasty! ), aren't they? :-) Thanks for the comment. Hi Debra, isn't it? Really good! :-) Thanks for the comment. Hi Lisa, yup, we've been having this a lot lately! Thanks for the comment. DELCIOUS! as my husband put it - restaurant quality! Absolutely gorgeous! I wish someone had made this for me yesterday!!! Hi Melissa, yup, it's good. :-) Thanks for the comment. Hi Mimi, guess you'll have to make it for yourself today! :D Thanks for the comment. Hi Anne, this is a great salad. Conversation-worthy. :-) Thanks for the comment. Hi Marcelle, the dressing is wonderful! As is the salad. :-) Thanks for the comment. Don't know how I missed this - it looks delicious! My kind of salad. Don't think I've ever combined radishes and salmon, sounds great to me. And Feta only kicks it up a notch. Great recipe, John! Hi Pam, radishes and salmon are wonderful together! Really good combo. :-) Thanks for the comment. What a pretty and perfect looking Spring salad, John. Cucumber and salmon are a lovely combo. Have a nice week ahead. Hi Amalia, it is! :-) Thanks for the comment. Hi Anu, we really like the combo of salmon and cucumber, and the feta is icing on the cake. So to speak. :-) Thanks for the comment. Hi Raymund, smoked salmon is SO GOOD in salads. Or all by itself. :-) Thanks for the comment. It salad sound wonderful. I love the smoked salmon! Hi Dawn, it's a great dish! And the salmon really adds a lot. :-) Thanks for the comment. This looks really refreshing. Now that the warm weather is here, this would make for a great light weekday supper. Hi Frank, it is refreshing -- not too filling, but just enough. Thanks for the comment. Love your salad, its gorgeous and simple too. Now I am working in a job that requires I bring my lunch, I need all the ideas possible. Thanks John. Cant wait to try this bad boy! Hi Anna, they really are peas-poor, aren't they? :-) Anyway, this is really good stuff -- bet you'd like it! Thanks for the comment. The hot weather has just finally arrived here in Chinon and I'm craving salad. And, oddly enough, I'm craving smoked salmon, too. I must make this salad now and I (who almost always adds feta to salads) loves the idea of using feta and yogurt to make a creamy dressing. Hi Jamie, that dressing is really nice -- works really well with the salmon and cucumber. :-) Thanks for the comment. Hi Marta, quick, easy, and tasty definitely works for us! :-) Thanks for the comment.